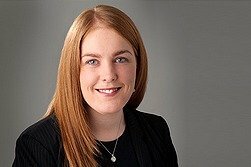 Elaine Farrell (nee McCormack) qualified as a solicitor in 2010 having studied in NUI Maynooth. She is a native of the Curragh. Her work involves residential and commercial property sales, purchases and re-mortgages, also residential and commercial tenancy agreements and family transfers. She holds Law Society of Ireland Diplomas in Insolvency and Corporate Restructuring and Commercial Litigation. Elaine is a member and Treasurer of the Kildare Solicitor’s Bar Association and she is a volunteer with the Free Legal Advice Centre.